So make sure to bookmark this spot and come back between 10 PM – 11 PM ET for our Elementary recap. While you wait for the recap make sure to check out all our Elementary news, spoilers, recaps & more, right here! 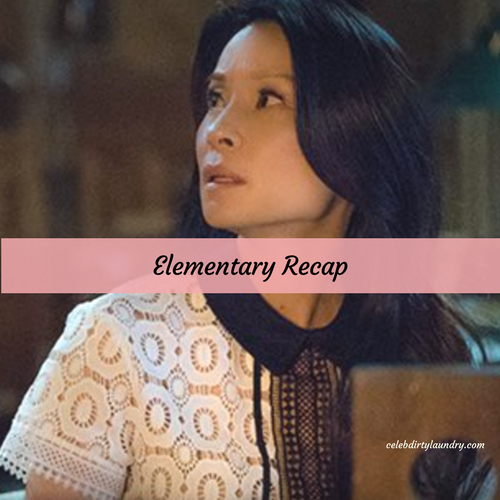 Tonight’s Elementary recap begins now – Refresh Page often to get the most current updates! Sherlock tells Watson that he believes that Shinwell murdered Jameel but she doesn’t believe it. She needs proof. Sherlock asks her to meet with Jameel’s brother and the police during their interview later in the day. A man purchases a self-storage unit and thinks he hit the jackpot until he opens a cabinet and finds a dead body. The team is called in to investigate. Sherlock thinks the victim, Travis, was a thief who worked for the city and stole the merchandise for people who were recently deceased. They interview the man who worked with Travis and admits that Travis was stealing but he didn’t have any part of it. Travis did call him the day before he disappeared and said he hit the jackpot and he won’t be into work anymore. They decide to check the possessions of the last person who died that Travis was working with. Sherlock believes that a captain’s log was taken for his possessions. Watson sits in on Jameel’s brother’s interview and he says he saw Shinwell walk away from the murder scene. He also saw Shinwell throw the gun away. He went and got the gun. He planned on killing Shinwell at his brother’s funeral but lost his nerve. He was only 10 years old. Then Shinwell was sent to prison and he moved on. However, when Shinwell got out of prison he felt he had to avenge his brother’s death. But he missed when he tried to shot Shinwell. Sherlock is convinced that the captain’s log belonged to Captain Emerson Barker and Barker was the pirate Black Peter. He thinks Travis stumbled onto a treasure map that leads to a significant bounty. The team goes to a bar where Travis last used his credit card and find a man who said Travis asked him to help him find a treasure. He turned Travis down because he already knew about the treasure but when he got to the sunken ship everything was already gone. If they can find who has the treasure they will have Travis’ killer. Sherlock goes to meet Shinwell and tells him he knows he killed Jameel. He wants to help Shinwell but he has to know the truth. Why did he kill Jameel? Shinwell denies he did it and tells Sherlock to leave. The team calls in a Sudan businessman because they have satellite footage that shows his yacht was over the sunken ship for over a week. He admits that yes he got all of the gold from the ship. He also admits he has the log from Black Peter but denies killing Travis or even meeting him. He bought the log for $25,000 online but used encrypted emails. He can’t help them find the person who sold the log. He does remember the screen name and gives it to the police. The team use it and are able to connect with a man named John Managen. The police go to his house to arrest him but his daughter admits she was the one who sold the book. She works online and helps people sell things on the web. The team decide to interview a man who worked with the salvage firm that turned down Travis request to go to the sunken ship. He isn’t very helpful but remembers seeing a flag. The team tracks down the company that made the flag and are able to find a professor. After interviewing her students they tell the team she was the mastermind, but she says Lars is the person they are looking for.